On Wednesday night, the third Republican presidential debate will take place at the University of Colorado Boulder. The debate, which features a whittled down 10 candidates (adios Scott Walker), will air on CNBC and will focus on key economic issues, including jobs, taxes, the deficit and the health of the U.S. economy. Clearly, topics like climate change have no place in this discussion…well, there was that major new study that found that we can't afford not to address climate change. 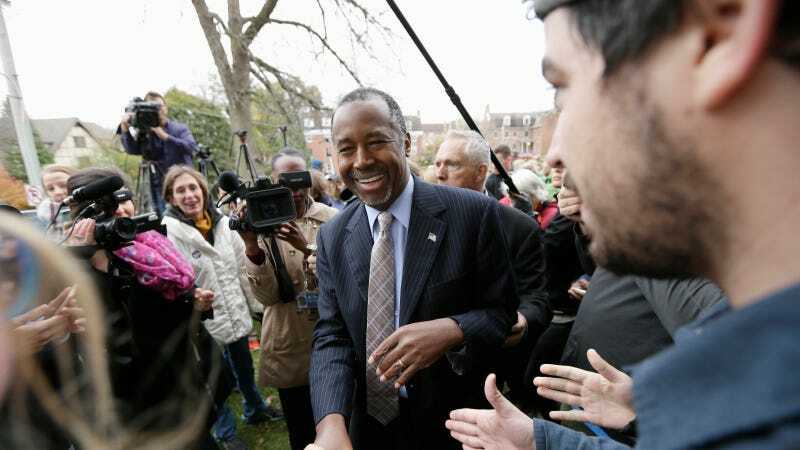 As in the last two debates, Donald Trump goes in wielding the spotlight, and his primary adversary—this time around a surging Ben Carson—will try and pick away at his sheen. Also as in the last two debates, environmental issues are likely to take a seat somewhere far outside the event space, in this case the 11,000-seat Coors Center. But in bizarro debate-land, where questions ranging a wide-yet-topical gamut are asked regardless of their political popularity, a Colorado debate would provide such good background—and background material—for an in-depth environmental discussion. The Flatirons mountain formation is visible behind the the Coors Events Center, left, the venue for the Oct. 28 Republican presidential debate, on the campus of the University of Colorado, in Boulder, Colo., Monday Oct. 26, 2015. There is very little that congressional Republicans despise more than the the Obama administration's Clean Power Plan, an effort to reduce greenhouse gas emissions from power plants significantly over the next 15 years. The final rule was just issued in mid-October, and already Republicans are out in full force to destroy it, including a legal challenge from 24 states. One of these states is Colorado, which now finds itself in a unique predicament thanks to Gov. John Hickenlooper, who said this week that he would bring Attorney General Cynthia Coffman's lawsuit to halt the Clean Power Plan to the state Supreme Court to question its legality. "This notion of everyone suing all the time every time you disagree with a specific remedy, a specific statute, is part of what makes people so frustrated with government," Hickenlooper, a Democrat who supports the Clean Power Plan (CPP), told The Denver Post's editorial board. The CPP calls for a nationwide 32% reduction in greenhouse gas levels by 2030 as compared to 2005 levels. Each state has an individual target based on power mix and available resources, and Colorado is supposed to cut 28% of its greenhouse gas emissions from power plants by 2030 as compared to 2012 levels. Hickenlooper thinks Coffman's lawsuit could impede the state's process for meeting this mandate. For her part, Coffman said she is pursing the lawsuit out of her "responsibility as the independently elected attorney general to serve as a check against the abusive, unlawful exercise of federal power over the lives of Colorado's citizens." She and other Republicans believe the Clean Power Plan violates the Clean Air Act and represents federal overreach. Many of them also don't believe in human-caused climate change, despite the overwhelming science. Coal production is declining in Colorado, as new numbers show that 2015 is on track to end up at an all-time low for the state. According to officials, the drop in production is linked to mining cutbacks at big energy firms, such as Peabody Energy's Twentymile Mine. There's a lot to talk about here. Peabody is the largest private-sector coal producer in the country, and has been struggling lately as falling demand and low coal prices hurt the broader industry. At the same time, Democratic presidential candidate Hillary Clinton said this week that Peabody is trying to "shirk its responsibilities" to pay the healthcare benefits of retired mine workers. Environmental groups have also recently targeted coal mines in Colorado, suing the Interior Department for approving their expansion without directly considering the impacts on climate change, air quality and other environmental concerns. Xcel Energy, Colorado's largest utility, expects to drop reliance on coal from almost 53% of its energy supply to 46% by 2020, with wind accounting for 24% of all energy and solar 4% by that time. The utility has been converting coal-based power plants to natural gas facilities in an effort to reduce pollution. At the same time, coal continues to be a vital part of the Republican energy platform, which the GOP considering it "a low-cost and abundant energy source with hundreds of years of supply." Back in August in a cleanup effort gone horribly awry, staff of the Environmental Protection Agency accidentally released up to three million gallons of toxic wastewater into the Animas River, a tributary of the Colorado River in southwestern Colorado. Instead of making the water safer as intended, the EPA dirtied the region and sullied the organization's reputation. Come to think of it, Republicans may be amenable to this talking point. However, the issue is far from crystal clear, and the mine, which had not been operational for almost 100 years, represents Colorado's long and unresolved relationship with the industry. This includes the way that regulations struggle to keep up with realities on the ground and how a complex web of stakeholders can lead to a less than pretty result. Agency officials said "that the toxic flood just highlights the need to deal with the rest of the state’s 22,000 abandoned mines." A report from late October put the blame for the spill—which tainted rivers in Colorado, Utah, New Mexico, and on the Navajo Nation with dangerous heavy metals including arsenic and lead—entirely on the EPA. The government investigators said that the "EPA cleanup crew rushed its work and failed to consider the complex engineering involved." Colorado, with its varied terrain and weather, is subject to a smattering of climate change impacts. A new report this October from the Center for American Progress projected that the U.S. Forest Service will have to spend 80% more per year over the next decade to fight wildfires in Colorado and other Western states, compared with the past five years. In Colorado, this could mean going from $44 million annually to almost $80 million. This summer much of Colorado finally emerged from a multiyear drought dating back to 2009. However, this relief is likely temporary. Climate models project Colorado will warm by 2.5ºF by 2025 and 4ºF by 2050, relative to second half of the 20th century. The state has already warmed some 2ºF since 1977. This warming will likely impact precipitation, snowpack, and water resources across the state. A recent state report found that water, agriculture, recreation and transportation could all be vulnerable to the impacts of climate change, and thus require costly adaptations and other measures.